I'm not quite sure when it started, but at some point someone thought it'd be a great idea to mix up two of the biggest science fiction franchises into one mega franchise. When Alien met Predator out birthed movies, comic books, toys and of course video games. 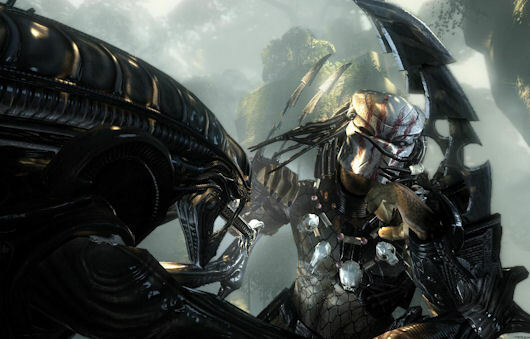 One of those games was a first person shooter, called Aliens vs Predator, it was released over 10 years ago on the PC and developed by Rebellion. Today they are back with a brand new version of the game where everything is new again, returning from the original are three separate, yet somewhat overlapping, storylines for each character. You'll jump into the shoes of the rookie space marine, don the mask of a Predator, and fill the claws of #6 Alien as he escapes from human captivity. 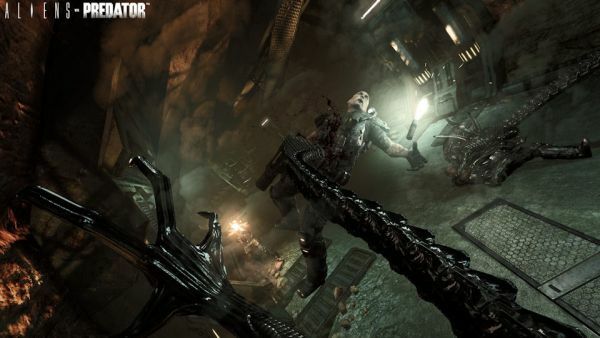 Each campaign offers its own unique flavor, which is then capped off by the game's multiplayer modes, only one of which is co-op. I'm going to guess 9 out of 10 people start the game as the Marine to experience the campaign against the Aliens. At least for me, it has the most draw despite being somewhat generic in theme. Maybe it's the lure of the ping of the motion tracker as Aliens close in, or the way the lights interact with the steam from the vents, or perhaps its the way the Aliens seemingly come out of the walls like some creepy swarm of bugs. For the most part the Marine campaign is filled with these moments, but somewhere along the way it loses the tension it creates so well as you enter giant outdoor areas and lush jungles. There's nothing bad about these sections, in fact, some of the jungle battles are quite fun; it's just not what I expected. The pulse rifle of course makes an appearance and is the most satisfying of weapons, next to the shotgun; but you'll find other devices at your disposal including a heavy machine gun, flame thrower and explosives. The worst part about playing the Marine is how your character gets overwhelmed with the constant need to use melee attacks to knock back your enemies. It feels out of place and, at least on the PC, isn't very intuitive. After the marine I moved onto the Predator campaign which, after training, drops you into the jungles to take on the Xenomorphs and Marines at the same time. At your disposal are heat vision, cloaking, super jumps, and your plasma cannon. The Predator plays a bit different than your standard shooter as hand to hand combat is an important role in fighting off enemies. With heavy and light attacks, counters, and grabs the Predator feels closer to Faith from Mirror's Edge than the Marine. One disturbing thing with the Predator is his finishing moves when grabbing enemies. You'll literally rip the heads off your foes or snap their backs over your knee, all in close up first person view. All of this attributes to how Rebellion wanted to make you feel like a one man army, leaping from tree to tree while locking onto incoming Xenomorphs, and then watching their bodies explode in an mist of acid. It's incredibly satisfying. In fact, I was surprised that I found the Predator missions the most satisfying of the three campaigns despite their stealthy nature. Finally I moved onto the Alien campaign, which opens with a gut ripping (literally) scene as you are born into the world of science as humans use you for experimentation. It isn't long before you get a chance to make your escape, and soon you'll be running on walls, leaping at prey and biting faces off with the best of them. While the sense of speed and power is the most intriguing aspect of the Alien, it's also the biggest downfall. The levels aren't always the best when trying to cling to the wall, or make it through a vent, and I found myself fighting the controls to get my Alien to do exactly what I wanted. The Alien is the weakest of the creatures so stealth is absolutely required. While speed can make up for some alarmed guards in certain cases, trying to get where you want to go is a lesson in frustration.